Man Versus Gator In The Steel Cage! The Seminole Indian tribe is a little different from your standard American Indian group. For starters, they’ve never actually surrendered to the United States government at the end of the Seminole Wars. They’re also the tribe to make the switch from being simple tribal gaming organization to actually owning their own casino company when they bought the Hard Rock Cafe and its various casino interests. Now, they’re trying to get one of the traditional Seminole sports, alligator wrestling, back into the mainstream. 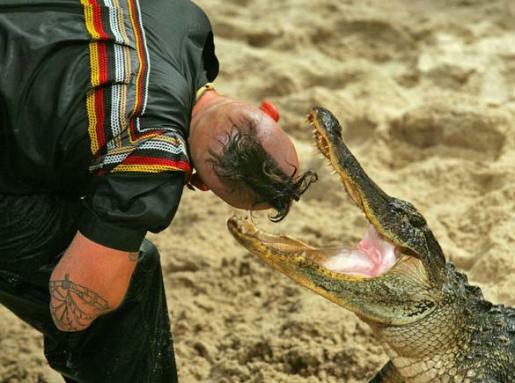 To that end, they’ve launched the Freestyle Alligator Wrestling Competitions (FAWC), and have one competition per month at the Okalee Indian Village at the Seminole Hard Rock Casino in Hollywood, Florida. The top prize for the most daring participant is $10,000. As you can see from the image gallery with the article, these guys are insane. Anyone messing with gators is probably nuts. Still, they probably have some cool stories about their gator experiences.